This blog has frequently (Do You Think Big Picture?) argued that data usually provides a different perspective and often more insight when the time frame chosen and used is relatively wider. An example of this principle in action was an article by George Athanassakos in The Globe and Mail where he examined Shiller P/E ratio in a wider time perspective. The Shiller P/E (price to earnings) ratio is named after Yale Professor Robert Shiller. More formally it is known as the Cyclically Adjusted Price Earnings (CAPE) ratio. The method uses 10 years’ worth of trailing earnings, adjusted for inflation, to account for the business cycle, which creates a “normalized” growth rate. Shiller has created a database going back into the 19th century. That’s what I think is a good “widescreen” perspective. The strong market rally of the past several months has promoted some analysts to express a concern that the market has grown overvalued. The Globe story does a good job to summarize why this might not be the case based on a wider time frame. [The Shiller] approach is quite different than the standard P/E ratio, which divides a stock’s price by its earnings per share over the past 12 months. While the standard ratio emphasizes current earnings, the Shiller P/E takes a long-term perspective that smoothes out the effects of the business cycle. By doing so, it hopes to ascertain whether the market is trading at a reasonable price compared with its sustainable earnings. Since the late 1880s, the Shiller P/E of the market has averaged about 16. Its current value? About 22. According to Prof. Shiller, markets show a strong tendency to revert to the average. At current levels, this tendency implies that stock prices will fall about 30 per cent – a scary number that is sure to unnerve investors who are still licking their wounds from the last market sell off. Not everyone, though, believes in Shiller’s P/E. The bulls find flaws; the bears swear by its accuracy. As a value investor, I believe the rationale and methodology behind Shiller’s P/E are better than the ones in the typical P/E ratio. In fact, the methodology implicit in Shiller’s P/E is not Prof. Shiller’s invention; it is the idea of Ben Graham, the money manager who largely invented what we know as value investing beginning in the 1930s. But while Prof. Shiller’s methodology is sound, I take issue with the way he and others draw conclusions about the markets’ direction, ignoring factors implicit in the theoretical value of the P/E ratio. The P/E ratio can be derived from the discounted equity cash-flow valuation model under the assumption of constant growth. It is then a function of a discount factor – the expected return on equity – and earnings growth. Here’s the catch, though. Unless interest rates (used here as a proxy for the discount rate) and earnings growth in the current period are comparable with the average historical interest rates and earnings growth, we cannot compare the current Shiller P/E ratio to the historical average and thus cannot draw conclusions about what it is telling us about the future. Mr. Graham, in the 1962 edition of his classic Security Analysis, states that “many investors are constantly making a choice between stock and bond purchases; as the yield on bonds advances, they would be expected to demand a correspondingly higher return on stocks (i.e., pay lower prices) and conversely as bond yields decline.” In other words, the higher that bond yields are, the lower we would expect the P/E ratio to be. The accompanying graph shows this relationship. 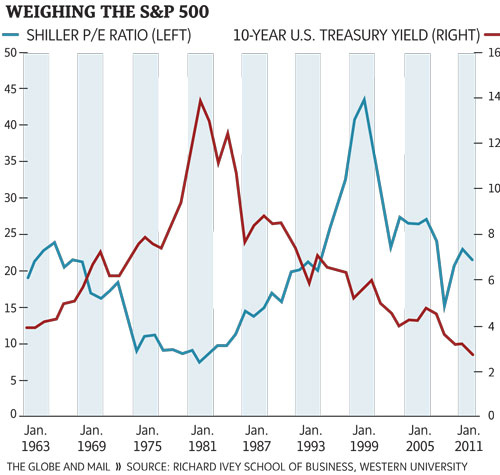 It plots the yield on 10-year U.S. Treasuries vs. Shiller’s P/E ratio over the past few decades. Just as Mr. Graham predicted, when interest rates are high, Shiller’s P/E is low, and vice versa. That suggests that today, when interest rates are at historic lows, Shiller’s P/E would be expected to be high. I am not saying this time is different. What I am arguing is that Shiller’s P/E ratio has to be compared with other periods when interest rates were low, such as the early 1960s, when the ratio fluctuated between 20 and 25 times. The current Shiller’s P/E ratio is not out of line with comparable periods in the past. Investors should stop worrying – at least, about this number.